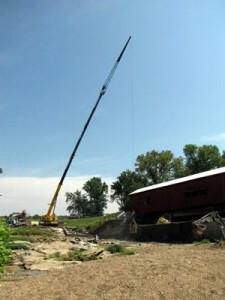 Since everyone was miserable and I had gotten the poisoning again … I hired a crane to finish the job. And what a crane it was. One hundred and fifteen feet tall. I called Misco and they said they would like to help. He made me a great deal. It was still a lot of money but not as much as it could have been.